Getting and Giving Information is probably the #1 competency required of leaders. If you cannot communicate effectively, then no other leadership skill will compensate for this lack. First and foremost, you must be able to exchange information effectively and accurately. There are three distinct aspects to communication, or getting and getting information: Getting it, retrieving it, and giving it. When getting or receiving information, you may be watching for a variety of clues to gather meaning: not only verbal or written information, but nonverbal behavior as well. If you are not careful, facts will be forgotten or distorted. This is because both the individual sending and the person receiving the information may unintentionally obscure the message. Take notes. Always write down key information received. Repeat back what you think you heard the person say. While you may think you understand what you think you heard, you may in fact have gotten it totally wrong. Clarify and verify! In a communication exchange, the sender controls what and how is said, or the content of the message. 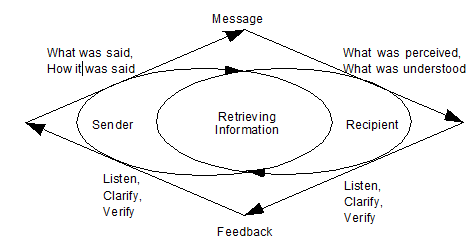 The recipient controls what is heard and the feedback given. To encourage good communication, you need to encourage others to speak freely. Show interest by leaning forward, paying attention, nodding in agreement, taking notes, and so forth. Greet new ideas with interest. Give the individual your undivided attention. Smile, relax, and be friendly. Information received may have to be recalled at a later time. There are many different ways to store and retrieve information. Today, we naturally think of computers as a means for storing and retrieving information. The medium is not as important as what your write and how you store the information. You can employ a variety of methods to help you remember details, including note-taking, repeating back, memorization, and mnemonic devices. Use language that everyone understands. Vary your tone and pace. Move from the general to the specific. Use visuals— charts, maps. and diagrams. Encourage two-way flow—ask questions and get them asking questions of you. Don't pass judgement on the question or the questioner. Use feedback and reflective listening to keep your verbal and non-verbal communication in sync. Take notes of the main ideas and review your notes soon afterwards to make sure they continue to make sense.